In April 2006 I checked out a beta version of the Dapper Drake release of Ubuntu Linux. I was really impressed by the polish of the desktop and the apparent thought that went into making the distribution. Besides being really amazed about the quality I also found some points for improvement. I set out to file several bugs, most of them being against the default Firefox theme included with Ubuntu, which didn't really match any of the desktop's colors or icons. Patiently I awaited responses, but as a long-time Ubuntu user I decided to take matters in my own hand and do something about it myself. I didn't have any experience theming Firefox but was eager to learn. Read on for the result, or go directly to the download and installation page. The first step was to learn something about how Firefox themes are built so I could create one myself. I found out that themes come bundled as JAR files which are actually renamed ZIP files. Unpacking some downloaded themes revealed the structure and building blocks of a theme. Toolbar icons are aligned grid-like in a single image file. At first, I fooled around by replacing the top row of icons with their replacements, creating some screenshots and asking people for their opinions. This was a good idea to get some initial impressions, but manually replacing each and every icon would be far too tedious and error-prone. And what was I supposed to do when an icon changed? On top of that, it costs a lot of time to create highlighted and disabled versions of the icons. I knew the solution but it would take some time. When I had decided to really go for it, I fired up my PHP editing environment and started writing some shellscripts. You might be biased against PHP, but for the task at hand it was the right tool for the job for, I know it would've taken longer in Bash or Perl. Yes, there are icons for which a scalable Tango icon is used in the Human theme. Luckily this is the same icon path taken in GNOME so all icons still match up with the desktop. With the fallback problem out of the way, I set out to automate the automated image composition. Enter Imagemagick, probably even more Swiss than a Swiss army knife, it's your command line assistant for image manipulation. It can be difficult to learn, but when you know it inside out you'll never have any problems automating image tricks anymore. A single row of Human icons arranged using Imagemagick. Being able to do this really speeds up the process. Next up were creating the highlighted and disabled version of the icons. These two chained commands give a good looking disabled effect. Multiple rows of automatically generated icons with state indication. Creating the rest of the icon images was a breeze once the boilerplate was in place. I decided to raise the bar even more, by automatically generating the theme preview images as well. 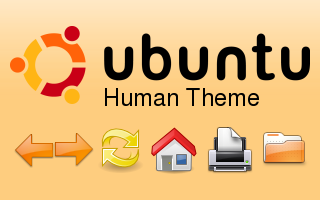 The automatically generated preview image for the Human theme. Adding the icons in the bottom row is done similar to adding the logo, so I won't repeat it here. With all the images in place, some patched CSS files ready and a nice preview I was ready to ship the first version of the theme to testers. I created some new RDF description files for each theme and packaged everything using the jar tool. Installation can be done using drag and drop on the Firefox Theme dialog or by creating some specially crafted weblinks. Speaking of which, download and install the theme here. The source code for the theme generation scripts can be found in the CVS repository. This project page was added on the 6th of May 2006.